According to MLB Trade Rumors, the Red Sox called Jarrod Saltalamacchia's agent to express their interest in bringing him back. Per my article yesterday, Salty had expressed his disappointment that the Red Sox hadn't been in touch, since he feels like Boston is the place for him. 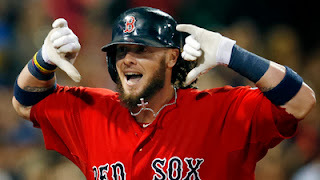 According to MLB Trade Rumors, the Red Sox contacted Saltalamacchia at about 7 p.m. last night, after the news came out a couple hours earlier that Salty was frustrated with the lack of a contract offer. As of this morning, there are no update on negotiation, but one theory right now is that they didn't make the qualifying offer so they could try and get him for cheaper than $14.1 million a year. Because I'm not sure he's worth that much. Sure, he had his best year, but he did not show up in the playoffs, minus the one walk off hit he had against the Detroit in the ALCS. The lack of production led him to be benched in the World Series for David Ross. What do you guys think? Let him walk and bring in someone like Brian McCann or re-sign him? Or just let David Ross and Ryan Lavarnway split the action next year, as some of the RSL Live crew suggested last night? Let me know on Twitter (@ConorJF1016) or leave a comment.